Can a bar-stem combo radically enhance ride quality? ENVE steerage on a Following MB makes for an Evil ride. ENVE is renowned for its carbon wheels, but the Ogden, Utah-based company offers a variety of other carbon components, including its often overlooked stems and bars. ENVE’s Mountain Stem comes in a 6-degree rise at lengths of 40, 55, 70 and 85mm. Aimed at broad range of applications, from XC to enduro, it weighs a scant 91 grams and offers the versatility of being flipped for more forward-positioning. At $265, it also has an industry leading price. The companion Sweep Mountain Bar features a 160mm width, 9-degree back sweep, and zero rise. Tipping the scales at 185 grams, the bar retails for a more industry-typical $160, and is also suited to a variety of ride configurations. Both components come with ENVE’s 5-year warranty and lifetime loyalty guarantee of half off retail. Paired separately with other makers’ components, the stem and bar excel on their own. Combined, their attributes complement as well as optimize one another, transforming the riding experience to a different dimension. When we outfitted our Pivot Mach 429 Trail a year ago with an ENVE cockpit, our aim was to save weight. 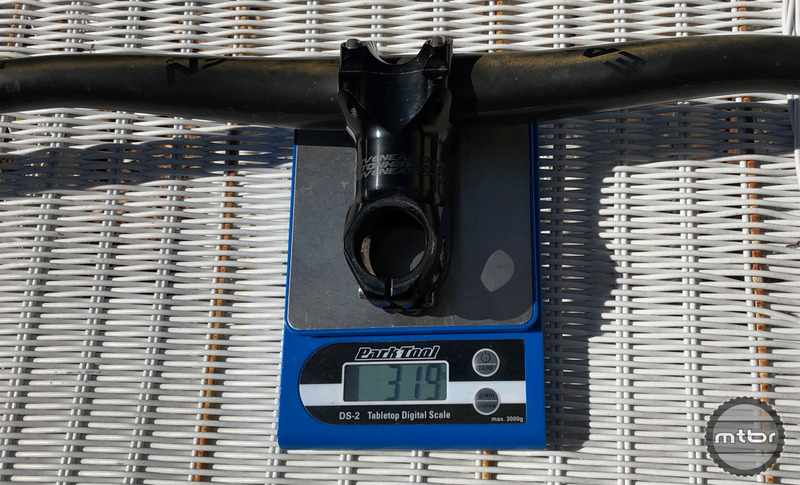 At 91 grams for the Mountain Stem and 185g for the Sweep Mountain Bar, ENVE’s setup was a quarter pound lighter than most, and would even knock 43g off our XC bike’s Thomson-Easton combo, which was 40mm shorter and not suitable for the Pivot). 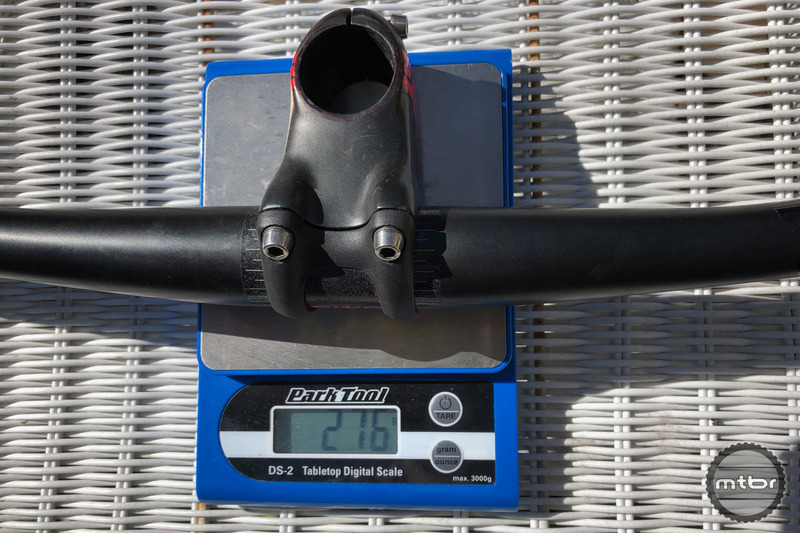 At 276 grams, ENVE’s combo beat out the shorter Thomson-Easton setup by 43g. In summer we typically opt for the Trail’s XC cousin(a Mach 429c), for multi-day excursions into remote high country. After six to eight hours in the saddle day after day, grams start feeling like ankle weights. Our plan was to transfer the ENVEs to the light bike once the months turned warm. But after a few rides on the Mach 429 Trail, we realized something was going on up front that had little to do with weight. The mated ENVEs were soaking up trail chunk like nothing we’d previously experienced. Not only was bar vibration noticeably reduced, fatigue factor over longer rides was diminished through our palms, wrists, and shoulders. Initially we wrote it off to our imagination. 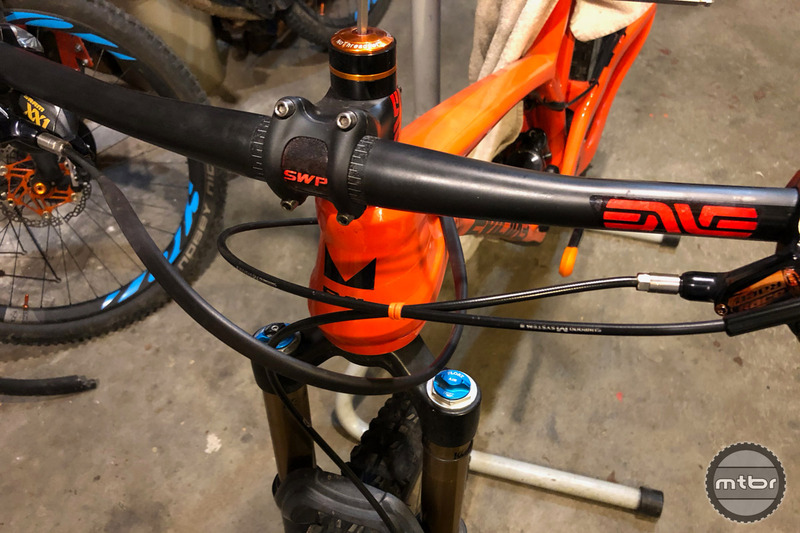 No way could a bar-stem setup make that much difference on the trail. It probably was just a carryover halo from riding the new bike. But just in case, we decided to experiment. We swapped the ENVE cockpit to our XC Pivot and got the same result – trail feel was altered dramatically. Then an Evil Following MB came into our possession. We tried the same back-and-forth test and got the same outcome. Curious as to how much the carbon stem all by itself played a role, we slapped on some legacy aluminum bars. While the resulting ride did nothing to make us nostalgic for an all-metal wheelhouse, it did convince us that ENVE was onto something. The carbon stem tempered even alloy’s harshness. 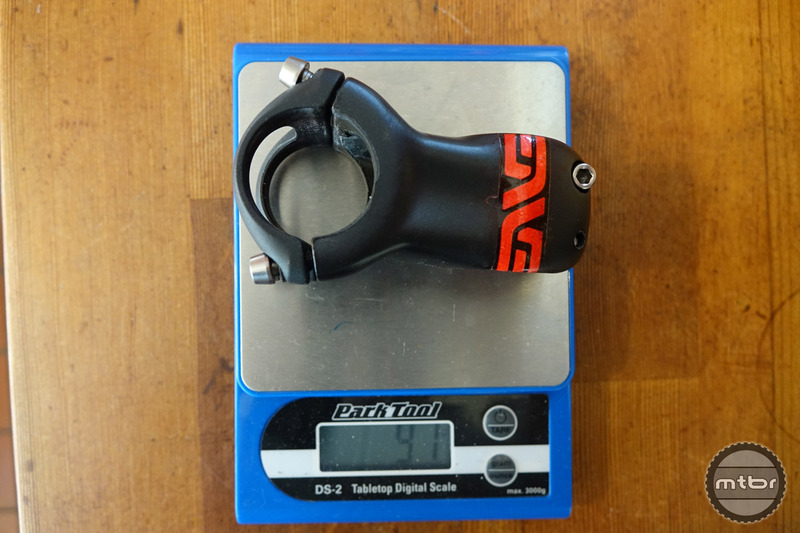 ENVE’s stem not only dampens but lightens the load at 91 grams (55mm shown). When you think about it, a lot of vibration gets transferred from the fore of the bike through the stem and bars. Carbon’s natural damping reduces the rattle. But carbon’s stiffness can be a problem on long stretches under load and at speed. The goal is a sweet spot of cockpit compliance, where trail jar is reduced while enabling just enough flex to combat neck, shoulder, and elbow stress, as well as wrist fatigue and the dreaded finger tingle. ENVE has cracked the code here. Its mountain bar-stem combo mutes trail chatter from stutters, rocks, and roots. It aids responsiveness on jumpy, twisty flow trails with lots of cornering. And over long rides, it eases general wear and tear on the body. Before testing the ENVE cockpit, we were never aware of the beating our upper body was taking. To check our impressions against actual science, we contacted the tech folks at ENVE’s headquarters in Utah. They chuckled at our wonderment but confirmed our observations. ENVE’s Goldilocks factor resulted from a lot of data crunching in the lab and shred time on the trail. Although no porker at 319 grams, the Thomson-Easton cockpit could not match ENVE in weight or performance. The other thing ENVE is famous for is premium pricing. The Sweep Mountain Bar sells for $160, while the Mountain Stem is $265. ENVE also offers AM and DH versions of its bars at different price points. Yes, this is a substantial investment. But think of it this way: Weight savings, engineering excellence, and ride quality don’t come cheap – but they do pay off.